San Xi Lou, Central. Lip tingling, tongue twanging Sichuan. I am a stupid gweimui. I used to go to a Sichuan restaurant in Causeway Bay, on the first floor of a building on the corner of Hennesey and Percival, but it didn’t have an English name. It was ludicrous hot, very reasonably priced, had monthly beer bucket specials and was just fun, fun, fun. So, when it closed about two and a half years ago, I was at a bit of a loss. Filled with sadness, I started hunting for a replacement, and have never been totally satisfied with what I have found. Yesterday, through the holy power of t’internet and Google translate, I discovered that said restaurant had reopened under a different name (and telephone number…*!$%!) in Mid-Levels. Coda Plaza to be exact. Two years ago it opened and two bloody years it took me to discover that. What a noddy! The new restaurant is called San Xi Lou, (and the old one was called Man Jiang Hong), and such is my fondness for their old restaurant, that I went there straight away for supper, and I can tell you my little chickadees – I was not disappointed. Food: Big menu, lots of quintessential Sichuan dishes, lots of chilli, lots of hot, lots of cold, good collection of soups too. It starts off well when they bring you pickles (for free: Hunan Garden…) that can blow the top of your head off. Gets you right in da mood. Stalwart of Sichuan dining, chicken with dry chilli and pepper (or stupid gweilo chicken as it’s more fondly known by me) San Xi Lou style, is a fully interactive experience. 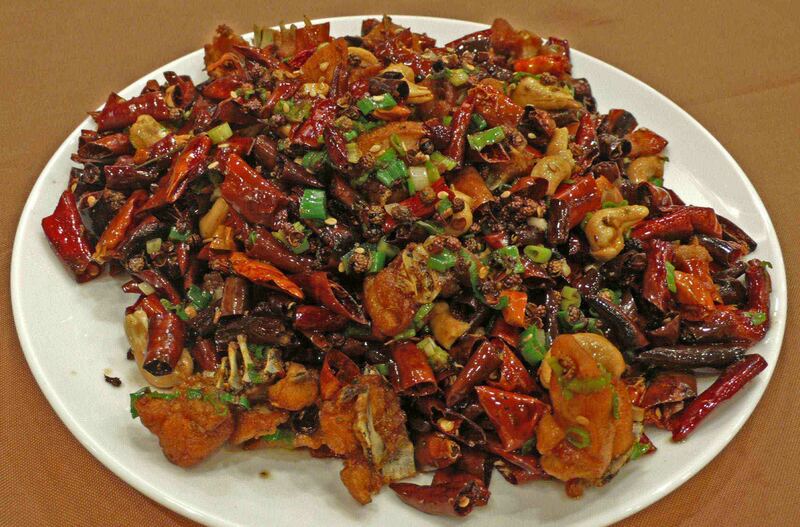 You have to dig for those nuggets of chicken through mounds of dry chilli and sichuan pepper. Oo, the fights that have taken place to try and find the last bits of chicken, the satisfaction of gnawing round the bones, the sweetness of the cashew nuts and the freshness of the coriander. Just delicious. As soon as my lips began to tingle from the hua jiao, my mind was at peace – certain dishes evoke big, happy memories, and for me this is one of my favourite. Let’s not get carried away though. This is not the most elegant Sichuan cuisine you can find in Hong Kong. It’s a bit greasy (well in fact some of the dishes are just huge buckets of produce stewed in oil), but I suppose it’s even more authentic because of this. I certainly haven’t come out of a Sichuan restaurant in Chengdu without a great, red, oily stain around my chops. What it is though, is solid Sichuan – silly hot, tasty and fresh. Service: Efficient, friendly – good service. The level of English varies by waiter, so for non-Canto or Mando speakers double check your order. Ambience: Understated. Brown and earthy shades – lots of carved wooden panels, straight backed, wooden chairs (but with cushions) and booths. Nothing slick or fashionable. Thick carpet, so the noise is dampened. It was busy and there was a real mix of Hongkees, Mandarin speakers and gweilos. Price: We paid HK$450 for two, including tea and beer, which we thought was good value. The food was very tasty, the portions large, the service efficient, and the surroundings comfortable. So there you have it – if you need a break from Madame Wong’s operatics at Da Ping Huo (I love the food, but I go less than I want to because a couple of her notes made my ears bleed) then San Xi Lou is a really good option. And who needs more than two Sichuan restaurants in Hong Kong? One is elegant and sophisticated in both cuisine and decor, the other is robust and unpretentious.